An alternate title for this story could be, "Using GPS in Genealogy, A Marvelous Tool, Part 2" See Part 1. We are fortunate to have tools such as the Global Positioning System (GPS) to help us navigate anywhere in the world. Initially for military use, and then expanded to commercial shipping, the technology has evolved to the point where every person on the planet either owns a GPS “device” or is directly affected by one. A feature on today’s cameras and smart phones often overlooked and underappreciated, is attaching GPS location data to ordinary images which is called geotagging. At the bottom of this story is a challenge with a prize. I encourage you to read on and go for it! The ubiquitous influence of this technology can be seen in a car, on the news and even in social media. Who could have ever realized that the Russian flight of Sputnik, the first man-made satellite launched in 1957, could lead to a geotagged selfie of a person on Facebook®? Consider what technologies are utilized in this example. Being used to send this image is a marvel of hardware and software including a mobile telephone, a GPS receiver, the internet and complex programming for the sender and the receiver of this information. But besides entertainment, are there other ways we can use these tools for self and public benefit, and how did GPS get to be so accurate? Of course! Between 1978 and 1985, ten NavStar satellites were launched as the first GPS system for military use. In the 1990s the first consumer GPS units became available and were accurate to about 100 yards. The inaccuracy was due to Selective Availability (SA) which is programming of the GPS signal to make them less accurate for nonmilitary use. During the 1990–91 Gulf War, the shortage of military GPS units caused many troops and their families to buy readily available civilian units. Selective Availability significantly impeded the U.S. military's own battlefield use of these GPS, so the military made the decision to turn it off for the duration of the war. On May 1, 2000 President Clinton turned off SA completely. Since that time, because of more sophisticated satellites, systems such as the Wide Area Augmentation System (WAAS) to augment GPS, and land based beacons accuracy has increased to less than 1 inch! The word Geotag is derived from geo, referring to earth and tag which means to mark. Closely related to geotag is the term waypoint. Waypoints are sets of coordinates (north or south and east or west) that identify a point in physical space referred to as longitude and latitude. If a person leaves the Earth they could also measure altitude. A geotag is that waypoint that has been attached to that application, photo or message. Depending on the technology and software, the geotag information may be more or less accurate. Accuracy however is relative to the needs of the user, in that a person looking for a restaurant, or car in a parking lot needs less accuracy than someone searching for something very small such as a property line or utility cover under snow. These two examples although practical, do not enrich our lives per se, so why should we know more? A beautiful plant or historical marker you want to show to someone else. A grave stone or historical landmark for genealogical purposes. A pothole in the road to notify public road or utility companies. The perfect fishing spot you found on your last outing. A quick reference to your location in an emergency situation. To enable Geotagging on your electronic device go to the Setup menu and look for an option to adjust your location parameters to enable or disable it. Once it is enabled, proceed to take a picture and then review the picture in your image gallery. In the image gallery open the picture and look for the option to show picture details. You should see a screen similar to the one left. 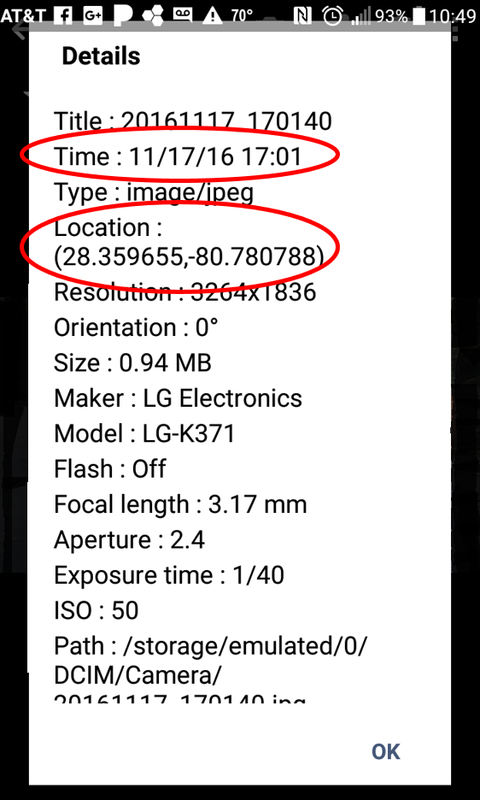 Notice in the picture details is the filename, date, time, etc., but most importantly, the information we need in under location where it shows exactly where the picture was taken. 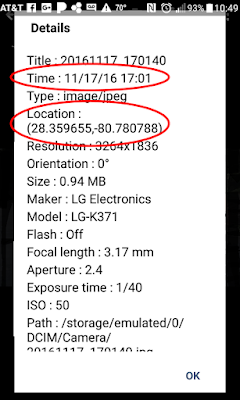 This number can then be recorded and then back referenced in Google Earth or other mapping software to find its exact location. Easy! Right? It does take some practice, but the information you can get from this simple feature may be very useful in the future. Tip! To enable "geotag" on your phone camera, open up your camera app and check the Settings there if it is not in your general Settings.